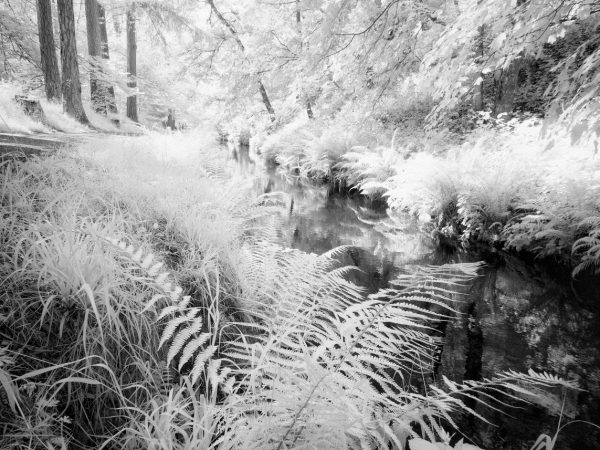 The processing of digital infrared photography seems to cause confusion and concern for those new to the medium. If this is you, I would like to reassure you that there is nothing to worry about. Equally, there are some who believe the digital infrared photos comes out of the camera looking great; which is not usually the case. Processing digital infrared photography is an essential step in producing a strong, finished image but it’s just as easy as processing any other image. This guide will walk you through a simple example. You are shooting digital infrared. Whilst it’s still possible to buy and use Infrared film (I still shoot with this), this article is focussed on digital. You will be shooting in RAW format using a camera that’s been converted for infrared. Whilst it’s possible to produce and process JPEG images, the best results by far are produced from RAW files. The processing is to produce a black and white infrared image and not a colour one. The process of producing what are known as false colour images from infrared RAW files is different and involves a process known as channel swapping. 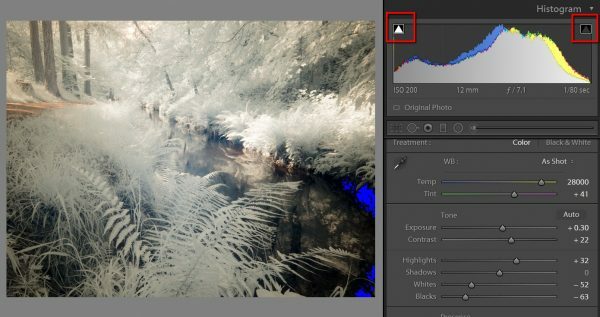 You are using (and know how to use) a RAW converter such as Lightroom. 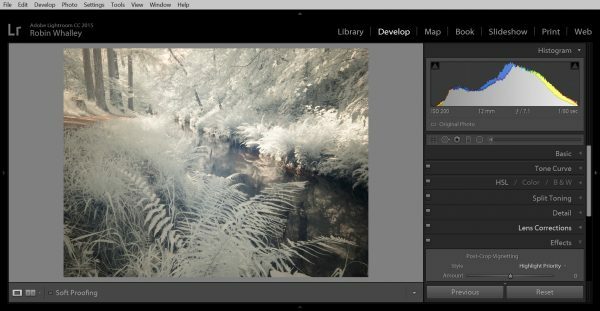 This guide will demonstrate the processing in Lightroom. In the following screenshot you can see a typical image captured on a digital infrared camera and viewed in Lightroom. Notice firstly that this is a colour image although the level of colour present is very limited. The processing we apply will therefore convert this to a black and white image. For that processing we will use the Nik Silver Efex plug in which is free to download from the Nik website. You can also see that the image features white foliage. This is known as the wood effect and is where some materials such as plant leaves are very efficient at reflecting infrared light. As the camera is only capturing infrared light, the leaves and grasses turn white. We will seek to emphasises this effect with our processing. Whilst the wood effect is always present in a digital infrared image, it may not always be strong. The levels of infrared light present will determine how strong the effect is. Boosting it during processing does help but if you want a strong effect, its best to shoot on days when the infrared light is strong. The ideal time is on bright sunny days when the sun is high in the sky. Shooting in winter when the sun is weak and low in the sky tends to produce darker images which can sometimes give the appearance of being shot at night. In contrast to the wood effect, water can turn black in an infrared image as the infrared is absorbed rather than reflected. Again, our processing should emphasise this. Two other effects that people often associate with infrared are in fact associated with one particular type of film (Kodak HIE) which is no longer available. These effects are film grain and halation. Film grain is an obvious one and Kodak HIE was known for being very grainy. Halation is the strange ethereal glowing that occurred typically around white foliage. Some people hated this whilst other loved it. The halation effect doesn’t occur with a digital infrared camera and must be simulated. Whilst making adjustments to your RAW images be sure to have the highlight and shadow clipping warnings switched on. You can see these indicated in the next screenshot. As you make adjustments try to avoid losing important detail. The clipping warning will highlight where this is occurring. In the above screenshot you can see that the water has turned to pure black where in the bottom right but this isn’t losing any important detail. It’s more important to make the water appear black. Other key slider adjustments are the Exposure and contrast sliders. Both of these have been increased to accentuate the effects discussed earlier. The whites of the foliage are also emphasised with the Highlights slider but this on its own could cause too much detail to be lost. The Whites slider has been reduced to help control this. Although we aren’t simulating the halation effect, a negative Clarity adjustment has been applied with gives something approximating to the halation glow once we apply some further adjustment with Nik Silver Efex. Feel free to make any other adjustments you see fit using the other sliders (such as Details) but these aren’t essential. The image is then ready for opening in Nik Silver Efex for the conversion to Black and White. 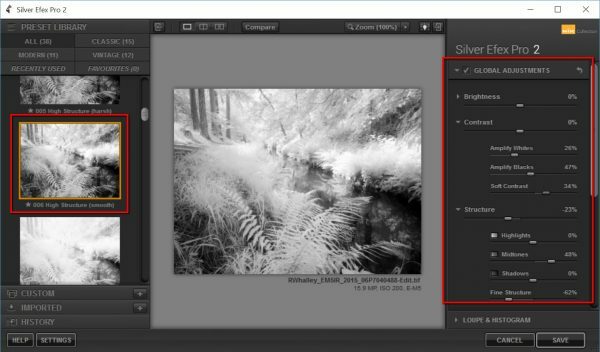 Nik Silver Efex Pro is the black and white converter within the Nik Collection of plug-ins. These plug-ins work with Lightroom and Photoshop and make adjusting your photographs much easier. At one time the collection cost hundreds of pounds/dollars to buy but recently Google (who bought Nik software) decided to make the plug-ins free. If you haven’t downloaded and installed the Nik Collection head over to Google and download it now. Open your image using the Silver Efex Pro as shown in the screenshot below. Here you should review the presets on the left side of the screen to see which produce the best effect. Once you select a preset by clicking on it, you will see the adjustments reflected on the right side of the interface. It’s then possible to adjust these further to refine the image. If you want to create a soft, glowing appearance in your image try to avoid increasing the contrast slider. Instead, to increase the depths of the blacks, use the “Amplify Blacks” slider. The Amplify Whites slider is helpful to boost the foliage. Use the Soft contrast slider to make the highlight areas glow. Previously in Lightroom we used the negative clarity adjustments. The Soft Contrast slider will enhance this effect further. Too much structure will reduce the soft ethereal effect so be careful when using these sliders. Also consider using a negative setting. If you add film grain, set the Hard/Soft slider to Soft for a more forgiving grain effect. Too hard a grain pattern can damage the other effects. Below you can see the finished infrared conversion. If you would like to learn more about how to use Nik Silver Efex Pro see my book “Dramatic Black & White Photography Using Nik Silver Efex Pro”. Processing infrared images is just like processing any other RAW file. The most important aspect is having a vision of what you are trying to create. Once you understand this, you can identify the image adjustments you need to apply. Excellent. Succinct and clear. I am having an X-Pro1 converted so this will save me much time (and some frustration). I would actually recommend a 665nm conversion. It’s more flexible and seems to give a better result in my experience. It’s also good for false colour if you decide to do that. On top of this, you can also screw higher wavelength filters such as the 850 onto the front of your lenses to convert them temporarily to a higher conversion. If you want to invest a bit more money in filters, a clear glass conversion is a good options. This removes the IR cut filter from the sensor. You can then use IR cut or IR filters on your lenses to give either a conventional camera or an IR camera. Personally, I would go for the 665 having owned both 720 and 665.